What do Jean-Michel Basquiat, Tino Sehgal and Andrew Goldsworthy have in common? Well, I didn’t really expect you to get that one. But the answer to this question is one worth discussing (in the ongoing dinner-table conversation with your kids that I have by now stirred up). 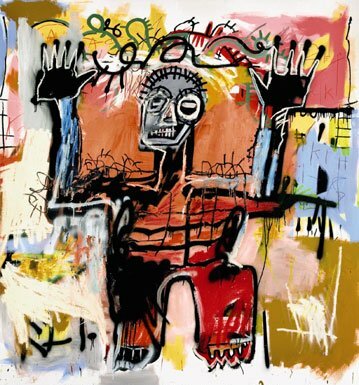 Jean-Michel Basquiat was an American who began as a graffiti artist and developed into a respected painter of canvases hung in galleries and museums. I was fortunate this year to see an extensive retrospective of his work in a museum. His paintings have an Afro-Carribean influence and also show hints of the influence of other artists of his time. But, for the purposes of our conversation, think of him as a graffiti artist. 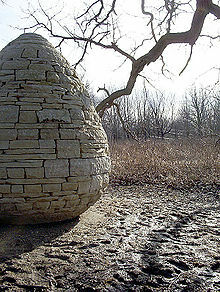 Andrew Goldsworthy is a british sculptor who works primarily in the outdoors making site-specific and land art. He makes art created out of what he finds in nature. Breathtaking, monumental art made of icicles, twigs, leaves and piled rocks. Tino Sehgal is an artist who creates situations meant to move his audience, meant to make them think but – not meant to be preserved. His work occurs in museums but is not documented in anyway. I recently saw his work “This Progress” – an installation of progressive encounters with people who walked with me, asking me questions (“what is progress?” “is progress always good”) as I ascended the spiral at the Guggenheim museum in New York. While my memories are sharp, there is no image to link here for you to see. The answer to my question is that all three men created in part, art meant to be temporary. Graffiti and land art are to more or less degree ephemeral in nature. Sehgal’s work is designed to be such. When you look at each of these art forms you find an unarguably appealing nature to them. Certainly Goldsworthy’s is the most widely approachable so, start there. What is it about the fleeting nature of his work that adds to its beauty? I asked my children this tonight at dinner. I admit, the 15 y/o rolled his eye a bit but then, even he joined in the conversation. They all agree that Goldsworthy’s installments are “really cool” but we struggled with the question of what their impermanence adds to the art. Does its fleeting nature make it more precious and therefore simply more valued (volunteered by the 9 y/o)? Do the changes that occur as Goldsworthy’s sculptures are decayed by the forces of nature (tides, wind, heat) allow for our own interpretations; our own artistic input in how we see them? Do my memories of Seghals situations similarly add to the interpretation of his art? Questions of vandalism aside, I find something magical about the creation of a graffiti mural that will soon simply become a canvas for the next artist. Is there something about art meant to be physically transitory that makes us pause and stretch our mind’s eye to really take it in? We are perhaps, encouraged to be really in the moment with this art that is by nature of the moment. To start your own discussion at home try watching these two very different but equally moving videos: Goldsworthy in action and graffiti being created. Consider making some of your own art at home as Meg Schiffler and her son did described in her terrific blog post for the SFMOMA Andy Goldsworthy: Big Tears (Part 1) and A Gift to the Backyard (Part 2).